Still feeling that there is something different about these mint versions vs the red. These feel quite different from the red yok or panda switches with halo stems in them. Anyone else notice? It’s either the spring or the tactile leaf, but I don’t like the tactility as much. It feels like an early rev of otemu sky switches. Too harsh, and it catches on the way back up just slightly. That’s extremely disappointing. I just received mine yesterday and ordered some halos in anticipation of finally experiencing holy pandas. Bummer. Before the spring swap, I would say the two modded switches (Holy Red and Holy Mint) felt about 80% the same. After putting the spring from a red YOK switch into the mint YOK with halo stem, I now say it feels 90% the same. So the majority of the difference seems to be the spring. I recommend trying a slightly heavier spring to reduce the catch on the way back up. Maybe a 68-72g spring? Anybody have consistency issues with each key? I’ve only put three together so far but one of them is noticeably less tactile than the other two. Could be just a common variance thing amongst switches. I’m still waiting on my shipment of halos from massdrop, so I haven’t assembled a full board of switches yet. But, I plan to as soon as they arrive. I’ve only tried 4 or 5 but they all seemed about the same. Do you find the tactility to be different than on the red YOKs or OG pandas? These are the first panda’s I’ve tried so I can’t confirm. Would love to get some more data points from others on their experience. Thanks for the tip. Is there a specific vendor you’d recommend picking up springs from? I ordered directly from Sprit on ebay, but they take a while to arrive. I’d give them a shot with the stock springs before you swap them out. Kailh Switches : Kailh MX Switches, Speed Switches. 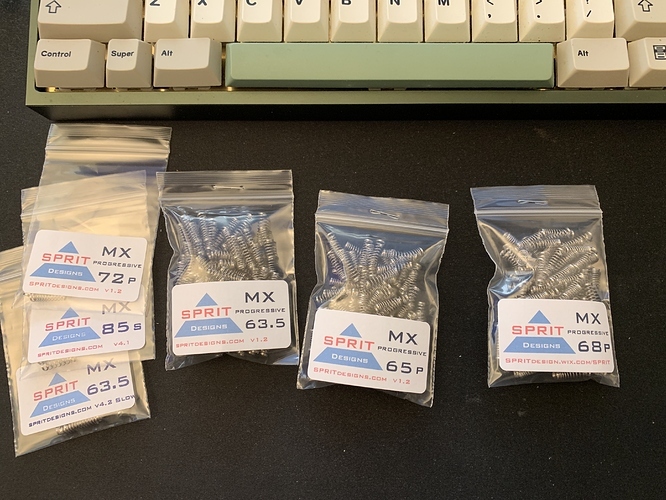 - MX Speed Linears : Cherry MX Speed Silver, MX RGB Speed Silver, Kailh MX Speed. 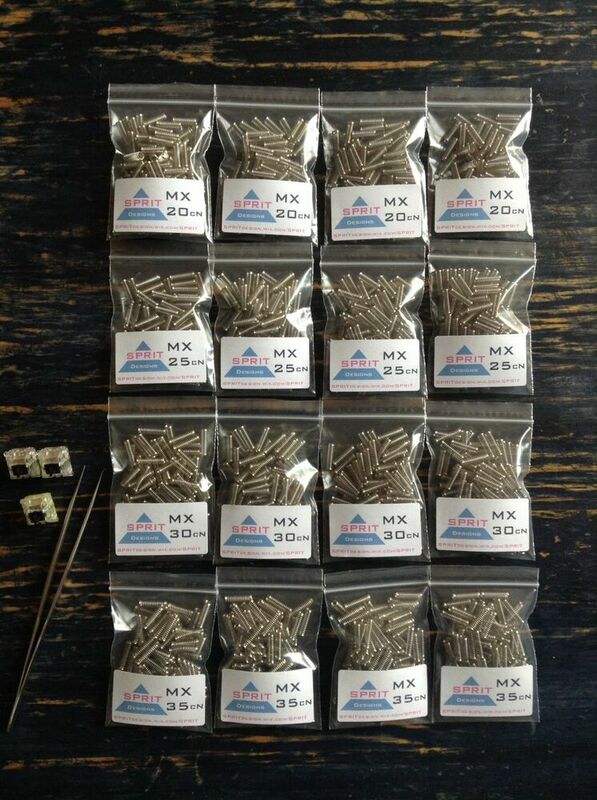 Kailh Box Switch Springs v1.2. Kailh Choc Springs - since April 30, 2018. Probably the 68s, 72s, or 78s would work best. I can confirm the 72g Sprit gold plated springs feel great in the red YOKs with Halo stems. That is the weighting I am using on my RedscarfII+ ver.C build I have them in. While the springs are a bit lighter than I would usually use I find them to feel just about perfect in this setup personally. Too bad 72g is above my comfort range. I’m going to try progressive springs in 6xg range. After that maybe slow springs. Short of making my own springs, that’s where that side trail stops I think. Progressive springs are something I’ve wanted to try also. I think for me a spring that actuated at the same weight as the 72g but ramped a bit heavier to like 75, 78g at bottom out would be even more ideal in red panda/halo stem combo TBH. You’re probably onto something there, let me know how it goes if you get some progressive springs in your prefered weight. BTW what are slow springs? Never heard of them, but they sound interesting! Re slow spring, there was a passing reference to reverse progressive (regressive?) spring at SPRiT site which I think is what springs labeled ‘slow’ at the site are. It’s supposed to be heavy at top and gets lighter toward the bottom. Also read elsewhere that Gateron Yellow’s infamous spring is a type of ‘slow’ spring so I think it’s worth looking into although I’m not sure what works with linear switches will also help with uber-tactile switches like Zealious V2 or Panda. Me neither, not without making one end shaped irregularly or applying a coat of another material on just one end. Yeah they took the “reverse progressive” stuff off the site once everyone pointed out it’s physically impossible and the orientation of the progressive spring doesn’t actually change the force curve. The slow “curve” (really its still linear) has a slower ramp up (so higher actuation) for a given distance, in the vain of gat yellows. I have v1.1 and V1.2 for some weightings and the v1.2 really exaggerates the difference between actuation and bottom out quite a bit. Heavies I ordered is 68g so I’ll try higher range next time. Thx! How did you guys go about ordering your springs? I had read some folks having issues with the SPRIT website. Would ebay be better? I ordered through sprit’s website. No problems for me! No problem for me either. These arrived today. 63.5P spring label missing the P threw me off for a second but 72P sample made up for it.